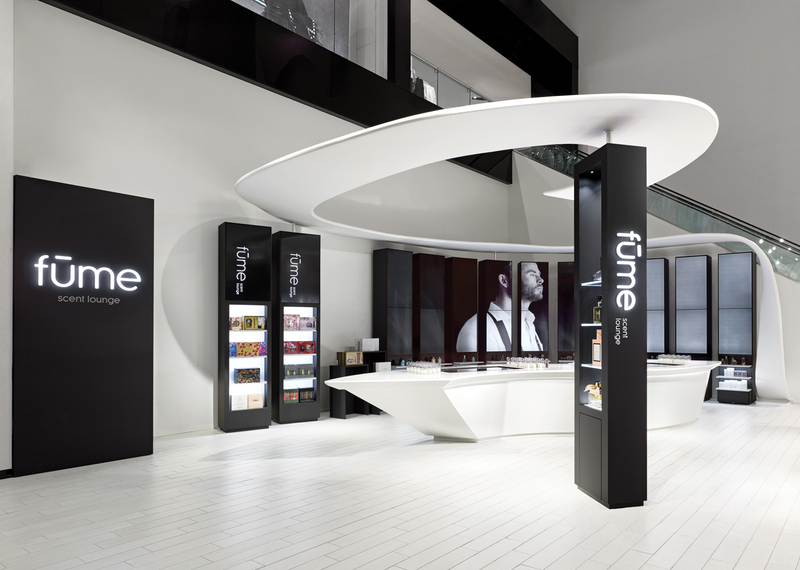 Toronto-based Eventscape recently engineered, fabricated and installed Coty’s Fume Scent Lounge, which blends digital and static signage, inside the Hudson Bay Company’s (HBC’s) department store at Yorkdale Shopping Centre. 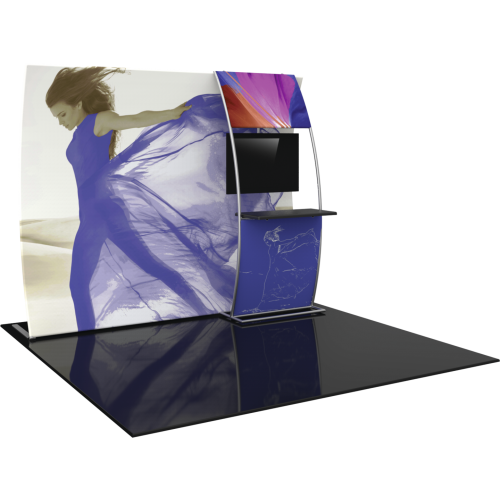 Working with designs from DK Studio Architects, Eventscape built a complex curved bar with integrated digital screens, a curved fabric canopy, 10 stand-alone digital towers with shelving and three additional towers with internally lit product displays for Coty, one of the world’s largest beauty and fragrance companies. The approximately 6.7 x 1.7 x 1-m (22 x 5.5 x 3.5-ft) bar, with double curves and an exaggerated cantilever, required an internal wood substructure clad with a heat-formed solid-surface material. 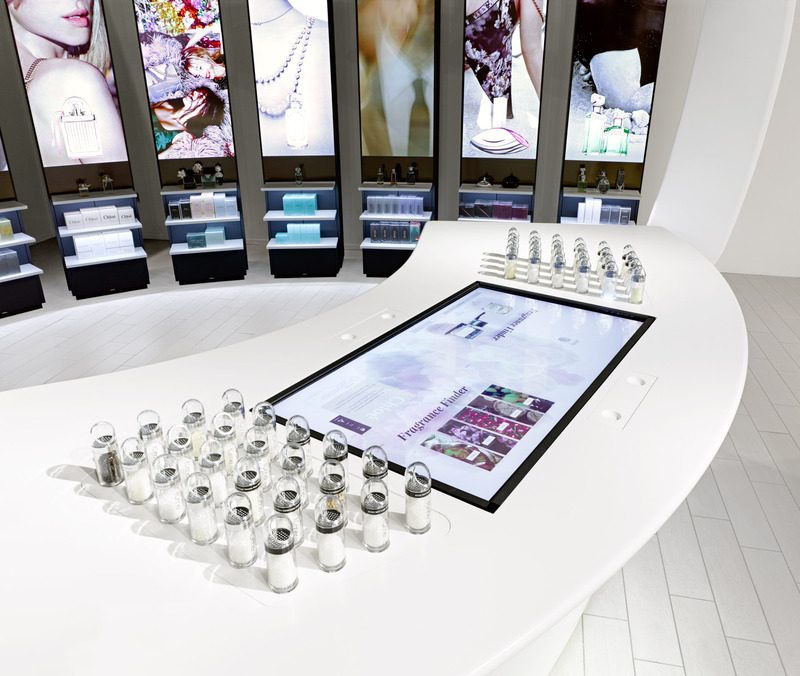 Customers standing at the bar can sample perfumes with shaker bottles placed on backlit solid-surface readers, which display all pertinent product information on-screen. By introducing this custom technology to provide a new way for people to experience the fragrances, Coty says the lounge is the first of its kind in the world. The 16.5-m (54-ft) long canopy was built with an aluminum frame and a double-sided white leatherette fabric covering, templated to ensure a taut, wrinkle-free surface. Its shape was inspired by a ‘scent fume’ mist. The 10 stand-alone towers support the canopy and form the store’s main video wall. They are clad in a premium black matte laminate to resist scratches, heat, shock and fingerprints. Of the three non-digital towers, two feature painted glass backers and illuminated solid-surface shelves, while the third uses side-lit glass shelves and recessed downlighting above the brand logo. After manufacturing and prefinishing the components at its production facility, Eventscape used a 2-ton spider crane to expedite installation. Minimal hoarding was required and the neighbouring shops were able to continue with business as usual. The Fume Scent Lounge opened in November 2017 with a major media launch.